verd de gris have been working on health and well-being projects for over 15 years. In Jan ’16 we were successful in winning a commission, working with Super Slow Way in Blackburn, to share our creative working method with a group of local volunteers with Blackburn CVS. The commission gave us the chance to show how our creative methodology could, with support and close attention, be used to help volunteers deliver their own participatory sessions with older people in residential care. We ran a programme of workshops with a small, focused group of volunteers introducing them to our combined arts methodology. We also ran a series of creative sessions in local care homes – to give the volunteers a greater understanding of how the methodology works ‘in practice’. 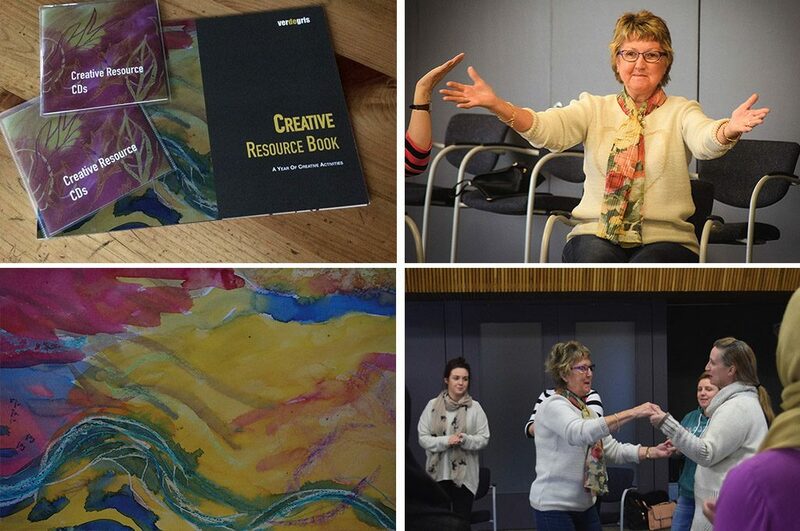 We have also been able to leave behind a simple and effective creative resource pack that can be used by our and other volunteers and / or care staff at residential care homes interested in adopting a creative approach. The pack was designed by verd de gris after working closely with two or three volunteers in situ, to ensure usability and relevance.